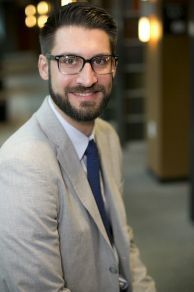 Silas W. Allard, Associate Director of the Center for the Study of Law and Religion, presented his research on immigration at two fall conferences. Allard argued that the United States has created an immigration system that addresses economic vulnerabilities through the use of low-skilled, undocumented workers. But, by failing to provide these workers with a legal means of immigrating, the U.S. assumes none of the responsibility for the workers’ vulnerabilities, including the health and safety risks associated with many of the jobs they perform. The U.S. provides legal means for immigrating for those deemed middle-class ready and self-sufficient, those who do not have the same vulnerabilities, Allard noted. Allard made the case that the refugee narrative encourages the perception of refugees as void of identity and defined by victimhood. The study of sacred scripture offers a more nuanced portrait of refugees. He explored the flight of the Israelites in the book of Exodus, as well as the Hijra, a defining moment in Islamic history and mythos. In these texts, fleeing is “a proper and righteous act to leave the conditions of persecution, to secure one’s own safety and dignity,” Allard said. The study of alternate narratives of asylum can shift the perception of refugees from victims in need of American pity and charity to people worthy of empathetic acts of solidarity. The themes in both presentations reflect Allard’s research on how current immigration laws and policies are founded in convenient narratives that serve needs of the U.S. as a receiving country, be it the need for cheap labor or the need for Americans to feel they are being charitable in accepting refugees who seek asylum. In addition to these conferences, Allard organized and served as a moderator at two immigration-themed conferences hosted by the Center for the Study of Law and Religion. The Religion Newswriters Association Pre-Conference brought together experts on the religion community’s response and obligation to immigrants. The Legal Ethics and Professionalism Symposium focused on struggles faced by immigrants in the legal system, from lack of access to representation to being caught in complex webs of immigration, criminal, and family law among others, which disadvantages immigrants in all of these arenas.